Additional HRA shall be granted to the civilian employees of the Central Government posted to States of North Eastern Region, Andaman & Nicobar Islands, Lakshadweep Islands and Ladakh, who leave their families behind at their old duty station at revised rates as per OM. No. 2/5/2017-E.II(B], dated 07.07.2017. 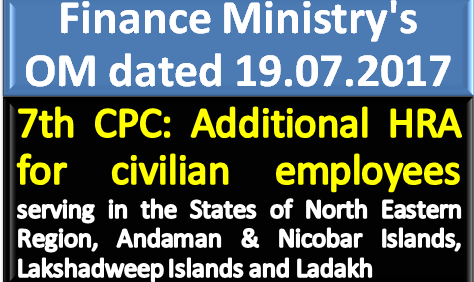 New Delhi, 19 July 2017: Ministry of Finance, Department of Expenditure has issued Office Memorandum on 19th July regarding Implementation of the recommendations of 7th Central Pay Commission Additional HRA for civilian employees of the Central Government serving in the States of North Eastern Region, Andaman & Nicobar Islands, Lakshadweep Islands and Ladakh. Consequent upon revision of the rates of HRA granted to the Central Government employees on implementation of the recommendations of 7th Central Pay Commission vide O.M. No. 2/5/2017-E.lI(B) dated 07.07.2017, in modification of this Ministry’s O.M. No. 11016/1/E.lI(B)/84 dated 29.03.1984 and O.M. No. 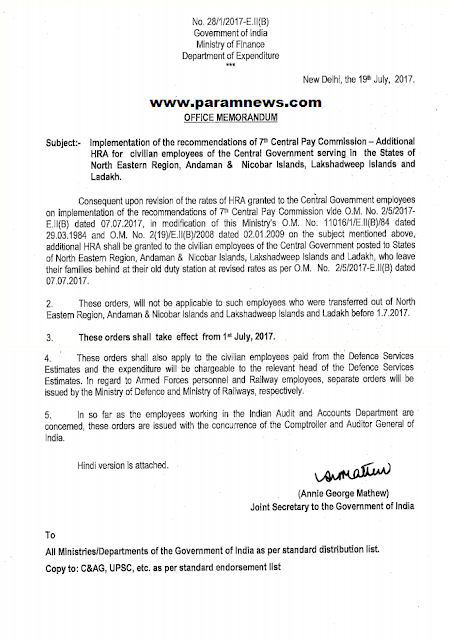 2(19)/E.II(B)/2008 dated 02.01.2009 on the subject mentioned above,- additional HRA shall be granted to the civilian employees of the Central Government posted to States of North Eastern Region, Andaman & Nicobar Islands, Lakshadweep Islands and Ladakh, who leave their families behind at their old duty station at revised rates as per OM. No. 2/5/2017-E.II(B], dated 07.07.2017. These orders, will not be applicable to such employees who were transferred out, of North Eastern Region, Andaman & Nicobar Islands and Lakshadweep Islands and Ladakh before 1 7.2017. These orders shall also apply to the civilian employees paid from the Defence Services Estimates and the expenditure will be chargeable to the relevant head of the Defence Services Estimates. In regard to Armed Forces personnel and Railway employees, separate orders will be issued by the Ministry of Defence and Ministry of Railways, respectively.